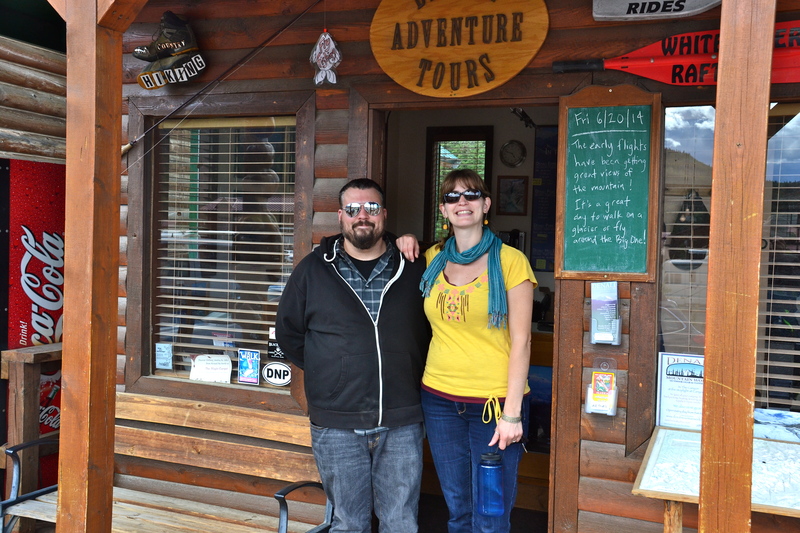 We have been at Denali for a few days now and are enjoying the international flavor of the tourist scene. Not only are the tourists from every place you can imagine, so are the seasonal workers. We are camped right behind the ice cream shop where several Bulgarians are working this summer. It’s one store in a long line-up of services offered along the boardwalk, from souvenirs to adventure trips to salmon bakes and pizza. 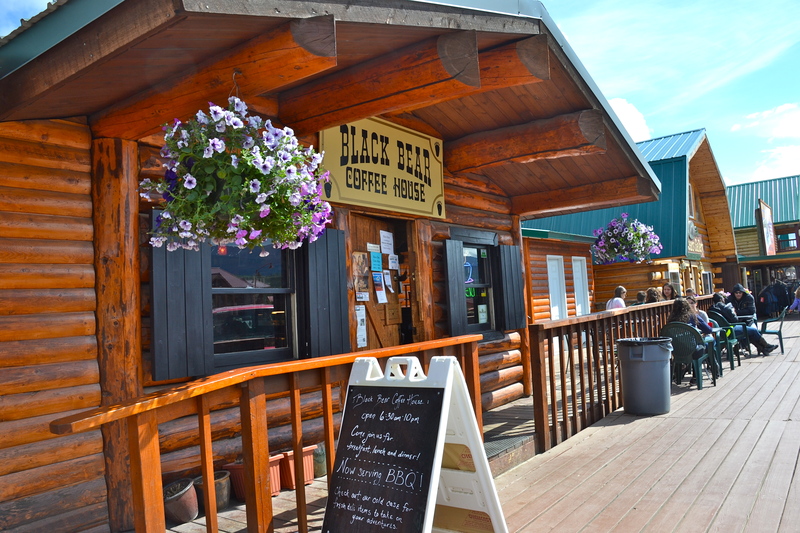 My daughter has worked for 9 years as a barista and manager at the Black Bear Coffee House on the boardwalk at Denali. Any day on the boardwalk or the campground we may hear an assortment of languages spoken, from German to Japanese to Russian. Not only are the inhabitants of this community a very diverse bunch, so are the sights and surroundings of the area. This morning I went for a bike ride through the canyon where the whitewater rafters and kayakers venture, while on the high bluff above a train went by loaded with sightseers, and a helicopter took off to fly over the ridge to a glacier landing in the next valley. 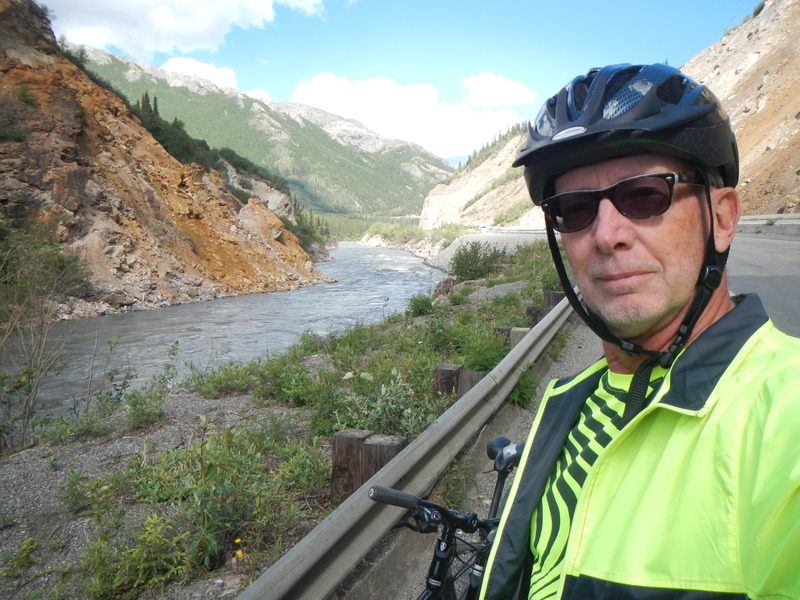 I biked through the canyon of the Nenana River where the whitewater rafters do their stuff. It is a delightfully eclectic mix of sights and scenes here, that makes every day interesting in its own way. It is very much unlike our environment in Michigan. Even the wildlife is foreign to us. We haven’t seen a whitetail deer in months, but yesterday were up close and personal to the caribou in the Denali high country. Weird. 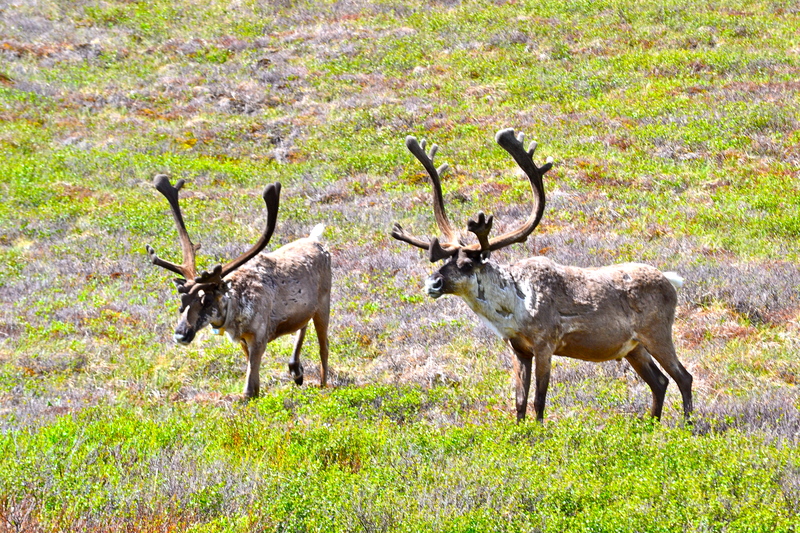 The hiking trails in the area offer close-up encounters with caribou, mountain sheep, moose, bears and more. Summer solstice was a new experience for us, with a beautiful sunset after midnight that didn’t turn into nighttime… the sun skimmed along sidewise just behind the mountain ridge and then came back up at around 3 am! 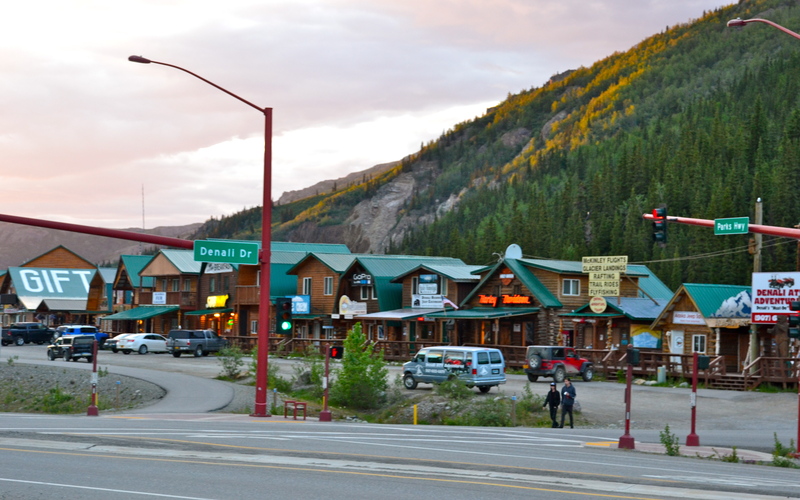 Nighttime never came at our little town at Denali on summer solstice. Every morning when I wake up I have to remind myself where I am… or just look out a window and let the mountains above the RV park do it for me. I finally got to photograph Mt. 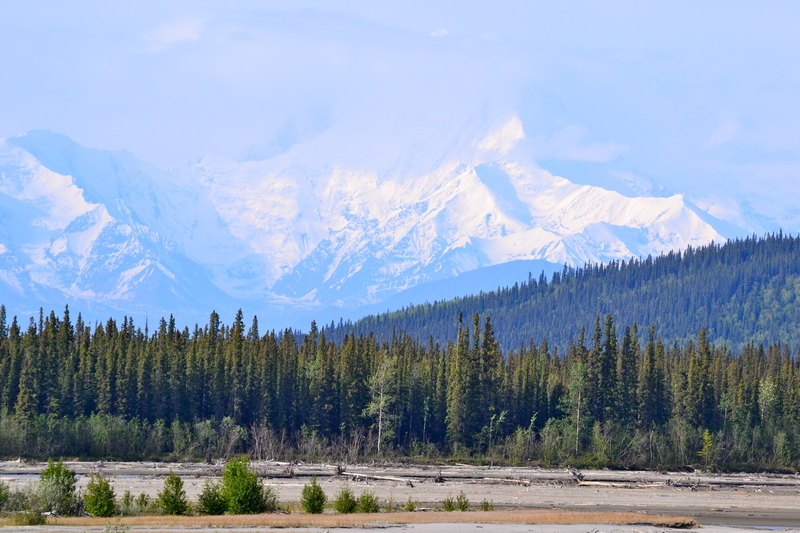 McKinley yesterday – from 75 miles away with a telephoto lens! I’m hoping to get closer on a flight-seeing trip sometime in the next few weeks. Mt. 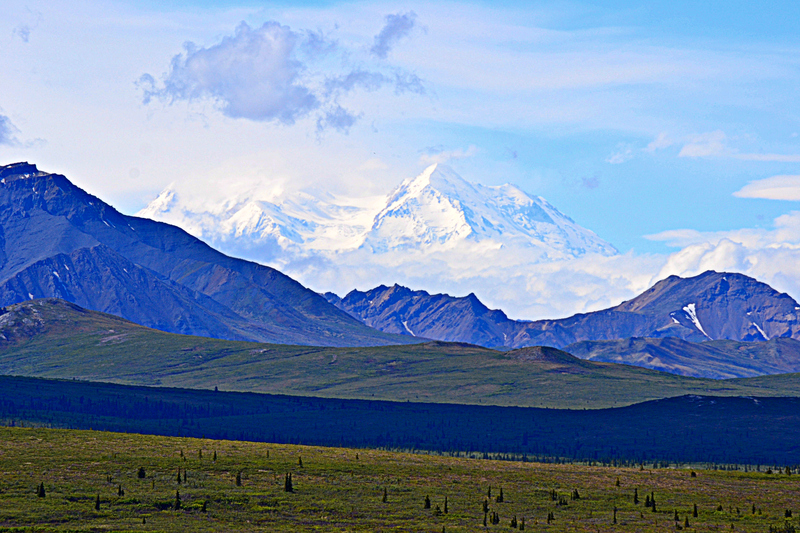 McKinley (Denali) from a distance of 75 miles on the Parks Road. So the Alaska vibe is a very eclectic one. I’d say that if variety is the spice of life, the flavor of Denali is seasoned to perfection. Great fun! 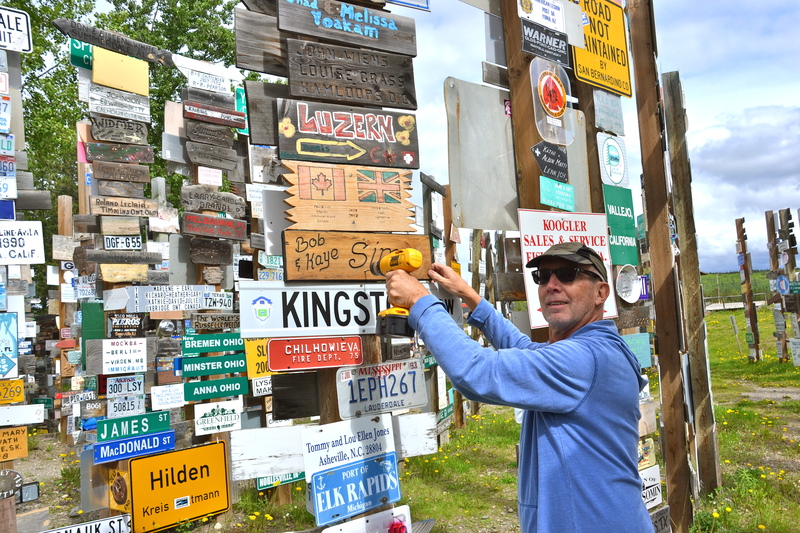 Milepost 3395 Dawson City, BC, to Delta Junction, Alaska. 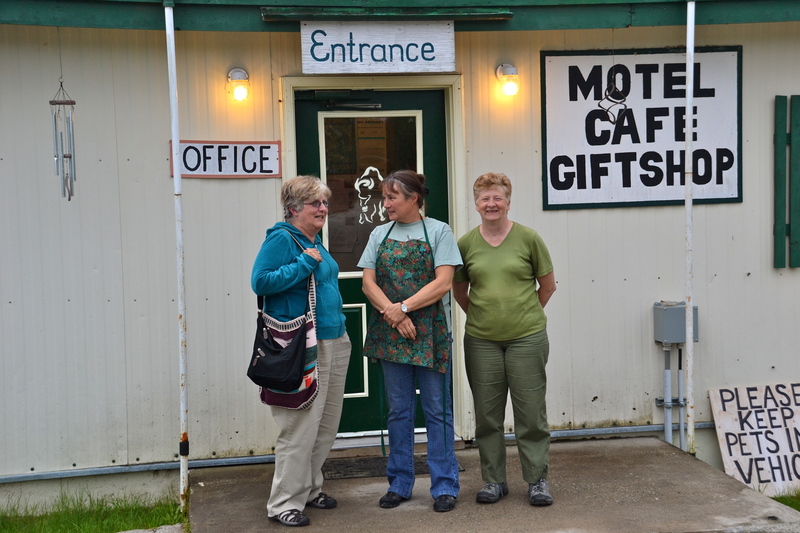 Donna at Coal River Lodge at Milepost 533, was the owner and chief cook for 14 years. Now her lodge is up for sale. The other unique trait of these immigrants to the great north was their eccentricity. It seems that the sort of people who would answer the call of the wild are the sort that are essentially non-conformists. Undaunted by solitude and the lack of conveniences, they had settled into the most unwelcoming locations this side of the border where services were limited and dangers were high. 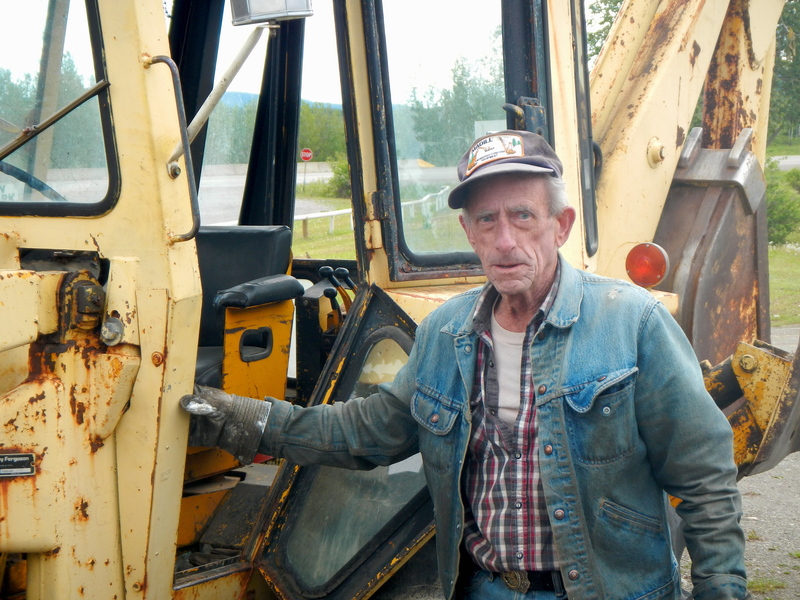 Paul has spent his life servicing the heavy equipment at the lodges along the Alaska Highway. 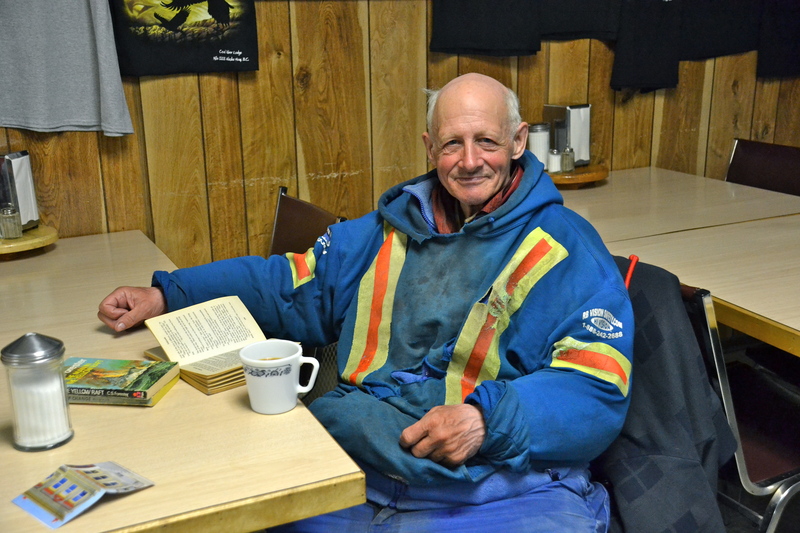 Homeless Alfred, born in Texas, is perpetually cycling the Alaska Highway, at 71 years old the constant wanderer sometimes pedaling all night to reach the next outpost. Every roadhouse and lodge was operated by displaced or re-placed – or maybe mis-placed wanderers. We met RV park owners who had come out from the city to start a new life, we met university students working a summer job in the tourist industry, and there were cooks and heavy equipment repairmen helping to keep the outposts operating for one more season. 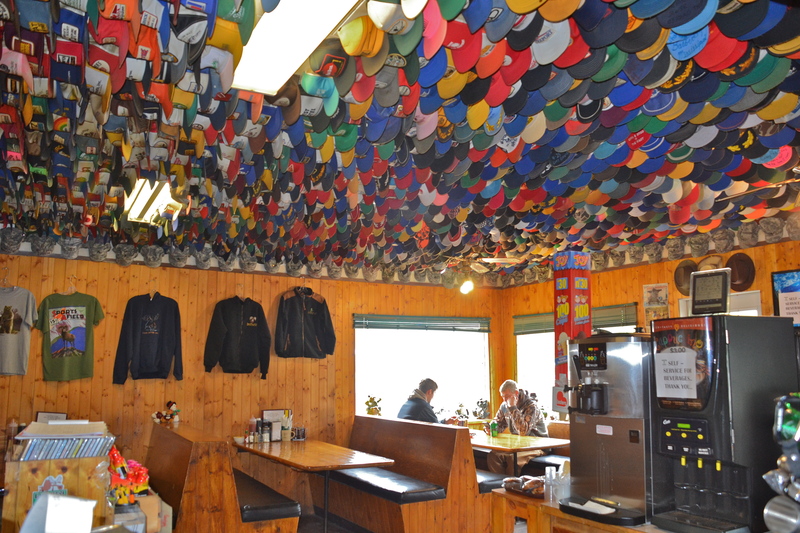 Toad River Lodge has a collection of 7,000 hats attached to the ceilings. The other thing that was unusual about these unusual business owners was the quirky attempts they made at competing for the diminishing tourist dollars. 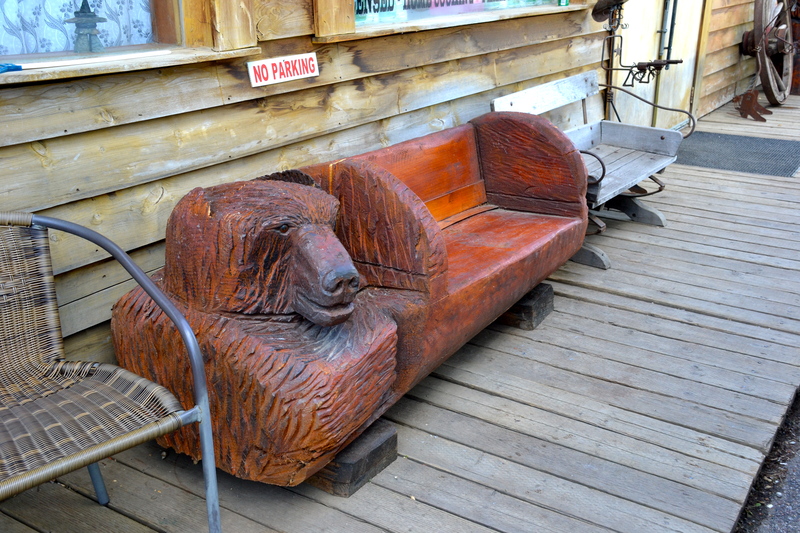 Chainsaw carvings were popular, Old West themed RV parks, the “world’s largest weathervane (a DC-3 airplane mounted on a post)”, a museum of stuffed trophies from musk-ox to moose, or left-behind WWII vehicles (the troop transport still operating for bear tours through the forests out in back). 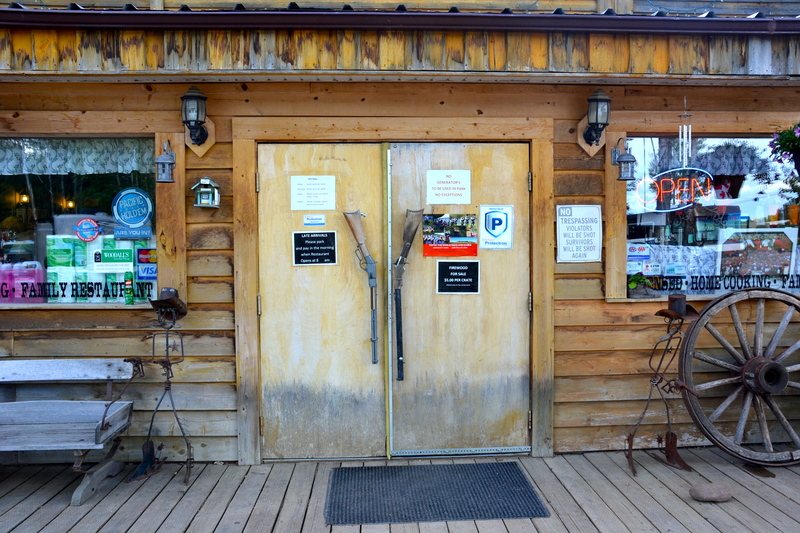 The western saloon-themed RV park at Fort Nelson, BC, had chainsaw-carved benches and rifles for door pulls. 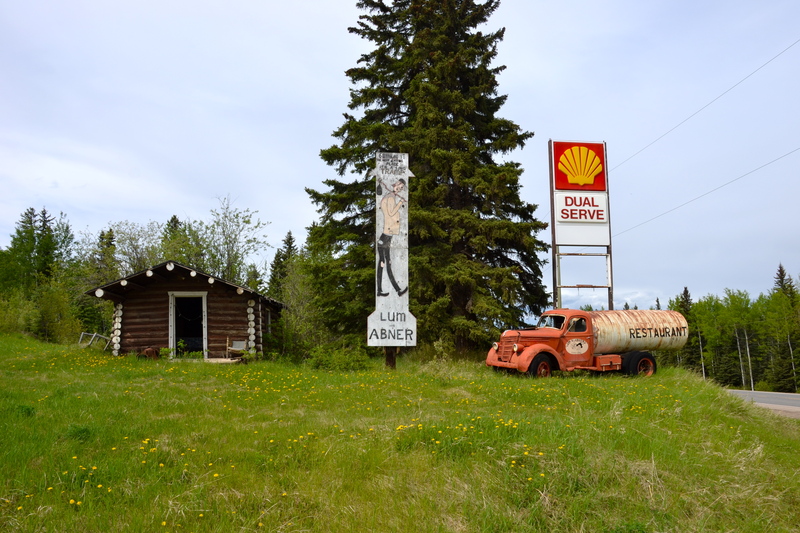 So, one of the off-handed delights of the Road Trip of a Lifetime along the Alaska Highway is the quirky and tenacious proprieters of the entire 1,500-mile-long complex who are keeping it all going. Or not. Perhaps two-thirds of the lodges we passed were closed and boarded up, some a long time ago, some last year. It’s a rough life up here, and it’s a rougher job trying to keep the outposts open when the tourist revenue is diminishing year by year. We developed a deep appreciation for these tough folks who serve the would-be adventurers like us, keeping us safe for the night and fueling us up for the next stretch of highway. Mighty good folks there, all along the way, and we enjoyed meeting them! 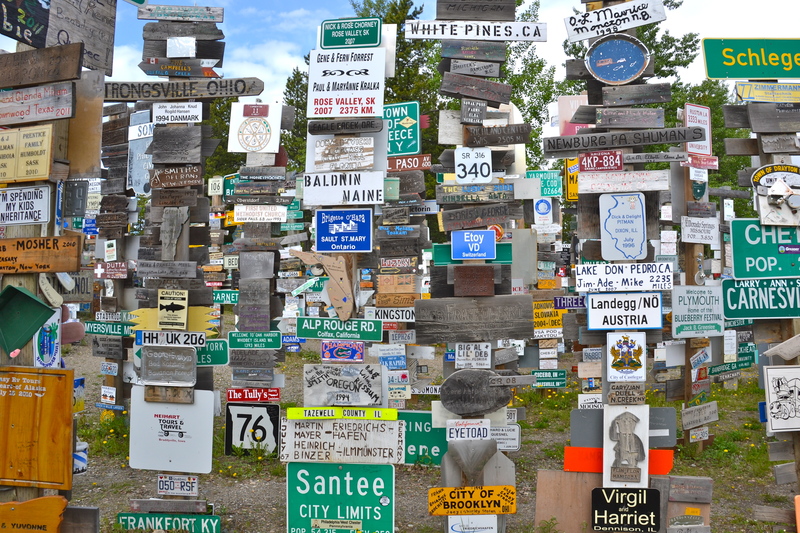 The Signpost Forest at Watson Lake, Yukon, was started by a US soldier who helped construct the Alaska Highway. We added our sign to the 72,000+ collection. The second log bridge at Canyon Creek was designed to carry military vehicles and civilian traffic alike. It would have easily supported our pickup and RV but we crossed a newer one. Kaye studied the ingenious log engineering of the early bridge builders. 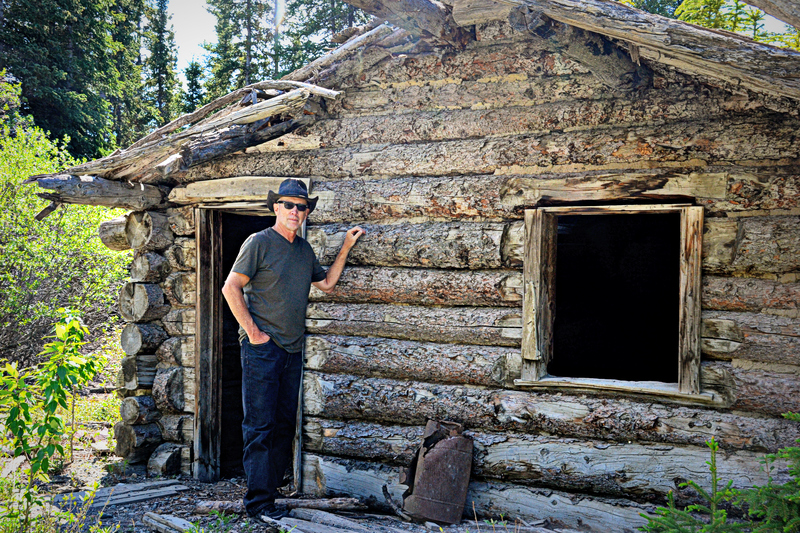 I explored the ruins of Silver City in theYukon Territory, a once-thriving mining town of 3,000 residents, now empty. 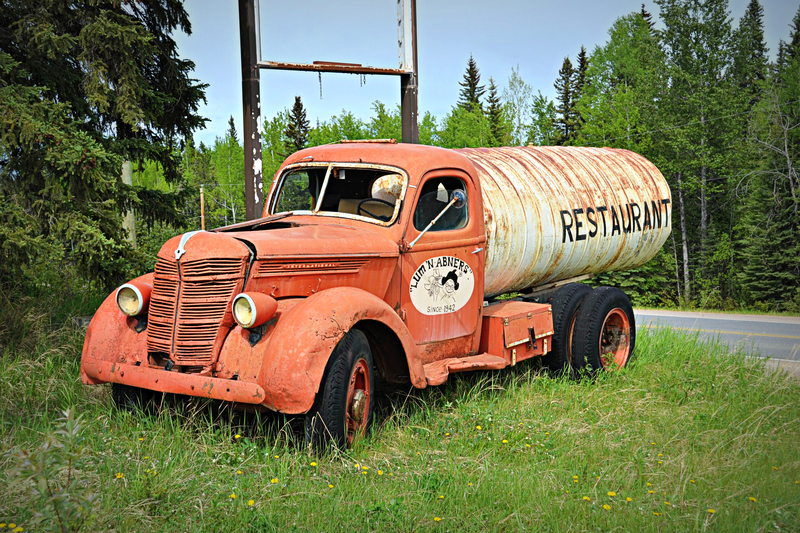 The roadhouses were built to service the traffic along the Alaska Highway in 1942-1943. This one at Prophet River BC, closed many years ago. “Lum and Abner’s, Since 1942” says the sign on the truck door. It’s part of highway history now. 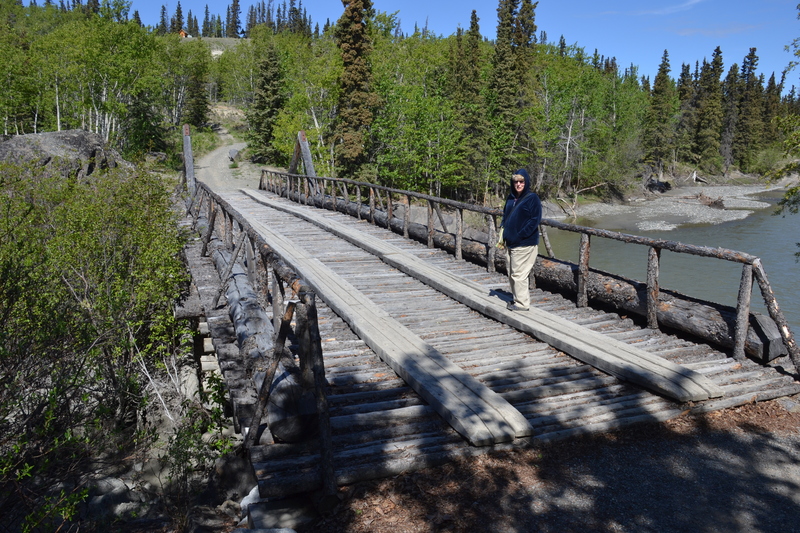 We finally reached Denali, a day’s travel past the end of the Alaska Highway, beyond Fairbanks. We have found a campsite right behind The Black Bear Coffee House where our daughter, Wendi, works every summer. I’ll be writing about their transient lives next. The Alaska Range looks majestic from the highway east of Fairbanks. Well, we have traveled the official distance of the Alaska Highway which covers 1,488 miles between Dawson Creek, BC and Delta Junction in Alaska. But nobody stops and stays in Delta Junction; it’s just an intersection on the way to several other more distant destinations. We are heading on to Fairbanks tomorrow and then to our final goal, Denali Park where our kids live and work every summer. I have made few blog posts along the way because I didn’t have access to the internet. Further, several of the RV parks we stayed at were so far from the electrical grid that they were operating on their own power plants, so we could hear the faint hum of the generator all night. Every village and lodge north of Fort Nelson has to generate its own electricity. I guess wifi is a bit much to ask for when there isn’t even an electrical power grid in place. 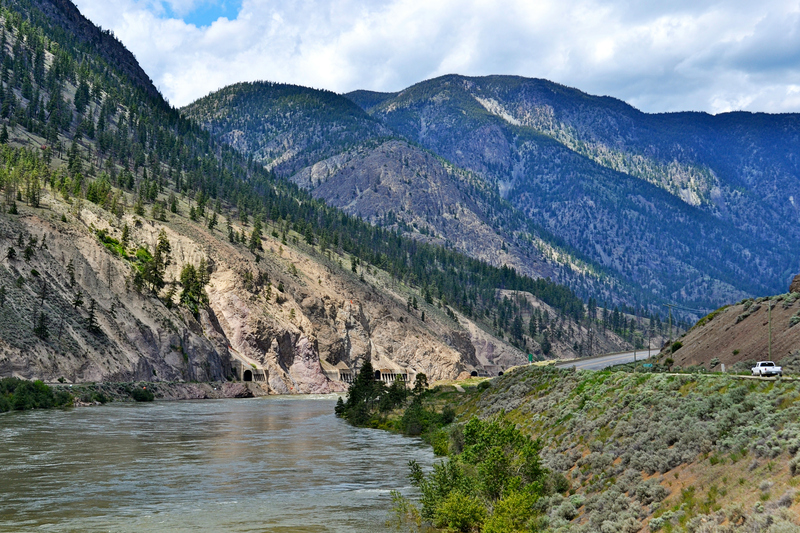 For hundreds of miles we traveled along the foot of the Canadian mountain ranges. That is, when we weren’t working our way over some steep high pass or through a narrow canyon. We developed a new respect for the Rockies here. No, call it what it is: fear. These mountains are beautiful from a distance, but up close they are intimidating. Our adventure threshold was crossed several times into the area of anxiety. It seemed we spent an entire day in second gear as the pickup labored up the steep climbs to Summit Pass only to be followed closely by the decline that required many miles of engine braking in order to save the brakes. Scary stuff, man. Our trek through the Yukon was an episode that deserves its own coverage, but let me quickly say that the roads there are terrible. The Canadian engineers either haven’t learned yet how to design roads that will not be heaved by the permafrost every winter and summer, or they don’t have the money to do it right. I suspect that funding is the big problem as there was a marked difference in the quality when we crossed into Alaska which is a rich petroleum state. Anyway, the frost heaves have rendered the pavement a mess of dips and ridges and mounds that have turned the highway into an off-roader’s dream. But for the RV-er it’s a nightmare. 35 mph was too fast for a lot of it. We entered the RV with caution at every rest stop to push things back into their places in the cupboards and re-organize the stuff in the fridge. I’ll be writing much more about this epic adventure in subsequent posts, but I want to say right here that, even though I didn’t entirely know what I was getting into, I do not regret my decision to assault the Alaska Highway with a pickup and an RV. It assaulted me back, but I have lived to tell about it, and tell about it I will. Watch for it in subsequent posts. With photos. I’ll add photos as soon as I return to digital civilization. 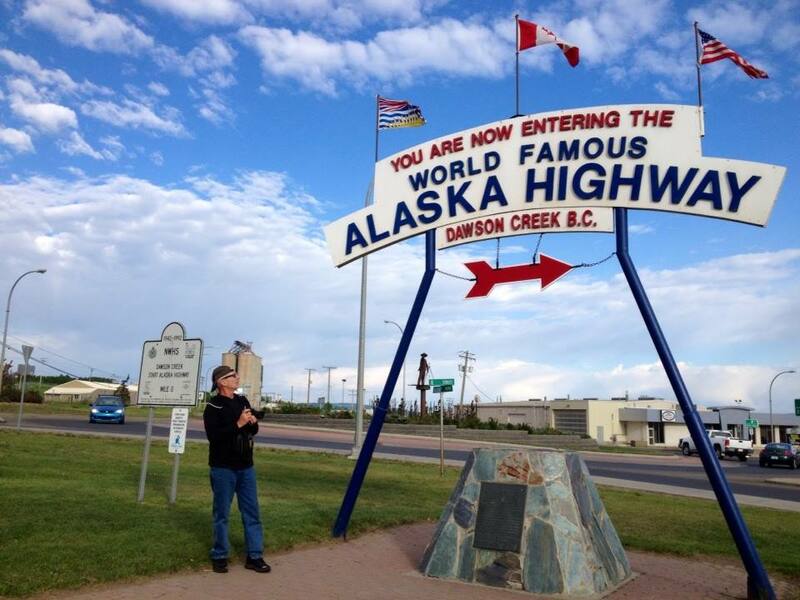 Today we made it to the official start of the Alaska Highway, Mile Zero, at Dawson Creek, British Columbia, Canada. That is after driving 2,000 miles northward from where we spent the winter and spring near Los Angeles, California. We’ve been on the road for eleven days, covering 1,300 miles up the west coast and another 700 after crossing the border into Canada. This is just the beginning of the next stretch of the road trip of a lifetime! We celebrated our arrival at the beginning by treating ourselves to a pizza in downtown Dawson Creek. Then we hit the Safeway market to stock the fridge and cupboards for the big stretch across the mountains and tundra to Alaska. It will take another week or more, and the outposts and fuel stops are few and far between. 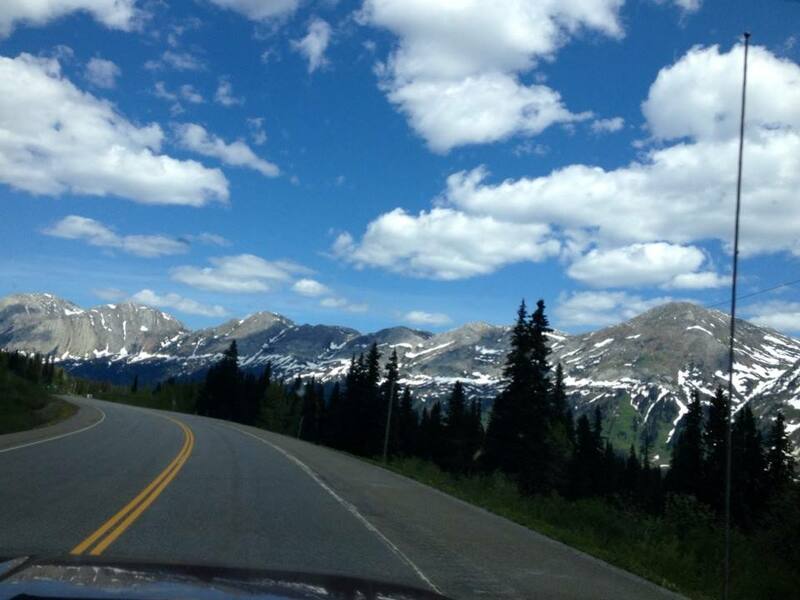 A panorama of the Rocky Mountains we drove around today. The scenery has been beautiful, an ever-changing panorama from narrow rocky river canyons to hilly forested highlands to snow-capped mountain ranges. We have churned our way up steep climbs, over passes, and then descended carefully down the other side. We have passed through tunnels and crossed countless high bridges, marveling at the engineering feats pulled off by the early trail blazers. Tomorrow we are hoping to put a bit more west in our northwest; it’s been heavy on the north so far. In fact, the compass on the dash seemed confused today as we managed a twisting stretch around a mountain range and drove east instead of west; it was dizzying. Tomorrows’ route is more straightforward, so we’re hoping to cover a lot of ground. Denali is waiting for us. We crossed the border into British Columbia yesterday and the border guard wanted to know where we were going. “Alaska, where our kids live and work every summer,” I said. “We are allowing two weeks,” I replied. “So you’re taking it nice and slow.” He seemed satisfied that we knew what we were up against and waved us through. Today I wasn’t so sure I knew what we were doing up here. We are traveling northward through the rugged Rocky Mountains, and our winding route today took us through seven tunnels and over several passes. There’s no easy way around it for the RV-er. The easy way would have been to fly to Alaska, but it’s too late for that, and where’s the challenge in that anyway? We must keep going. 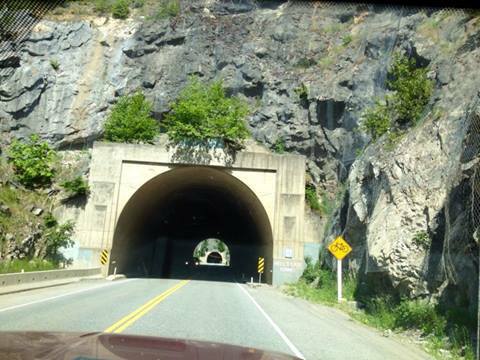 One tunnel leads to another on the road through the mountains. It seems to be slow going for us with the formidable terrain we are facing these days. We only covered about 150 miles today before we tired out and headed for a reprieve at a wayside RV park at Cache Creek, an old gold rush supply town that continues its service to wayfarers 100 years later. A close look at this photo reveals 4 railroad tunnels on the other side of the Fraser River. Today I re-named this place “the land of 1,000 waterfalls,” because it seemed that every little stream we crossed was plunging to its death in some beautiful leap off a precipice. The melting run-off has no other way to get to the mighty river below and eventually to the ocean. Rather like us having no other way out of this canyon but to get back on the highway and head farther north tomorrow morning. 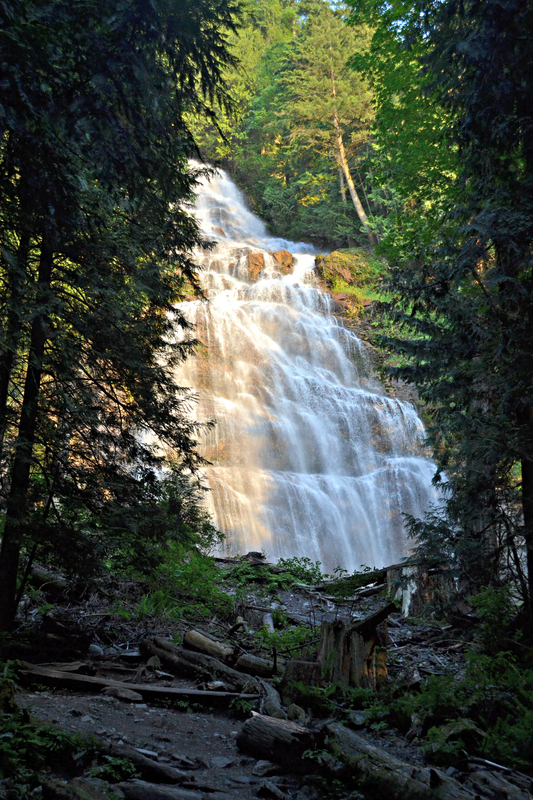 Last night we camped below Bridal Falls at Chilliwack, BC. But at least if we are in the middle of nowhere, nowhere sure is beautiful! We have been on the road for six days now and have covered just about a fourth of our distant from Fillmore, California, to Denali, Alaska. We have slowed down a couple of times to visit with friends and family that we haven’t seen in decades. Great reunions! The days are getting longer as we head farther north each day and it’s still almost three weeks to summer solstice. Tomorrow our goal is to cross the border into Canada near Vancouver, British Columbia. 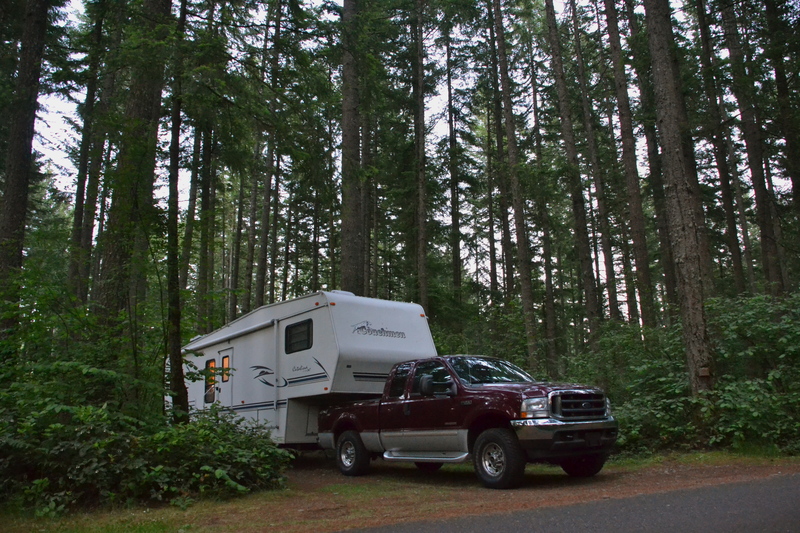 We have been enjoying a variety of campsites, from crowded line-ups with little privacy to the big woods in the middle of nowhere like where we are tonight near Olympia, Washington. Our campsite in the tall trees near Olympia, WA. While we have been charging through the west coasts great cities, San Francisco, Portland, Seattle, we have also blown right past some of the lower 48’s signature mountains: Mt. 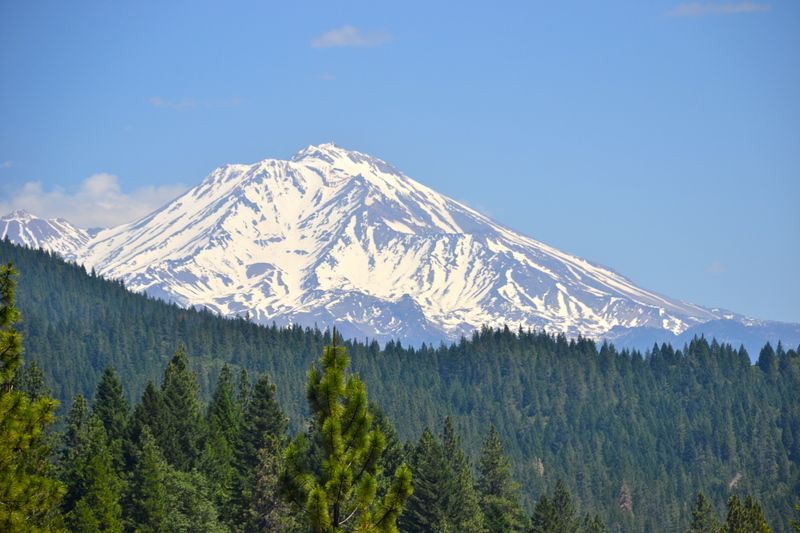 Shasta, Lassen Peak, Crater Lake, Mt. Hood, Mt. St. Helen’s and Mt. Rainier. I guess we are on a mission to get to the continent’s premier peak, Mt. McKinley (Denali). I have hardly had the camera out yet, because I’ve got both hands on the wheel all day. And when we finally stop to find a campsite each evening, we are usually near the freeway and don’t have time or energy to venture to the nearest attractions. We may have to return at some future point and dedicate more of our attention to the bountiful world of beauty that blankets America’s west coast. For this time, unfortunately, it’s mostly a means to an end. We breezed right past California’s signature peak, Mt. Shasta, only stopping for a couple of photos. His book is called Travels With Charley, and John Steinbeck did his research for it while on an extended circle tour of the lower 48 states in a Chevy pickup camper that he called Rocinante. We stayed two nights at Salinas, California, so we could spend some time at the birthplace and museum of John Steinbeck. We feel a connection with the author as similar travelers a generation apart. Kaye writes about it here. 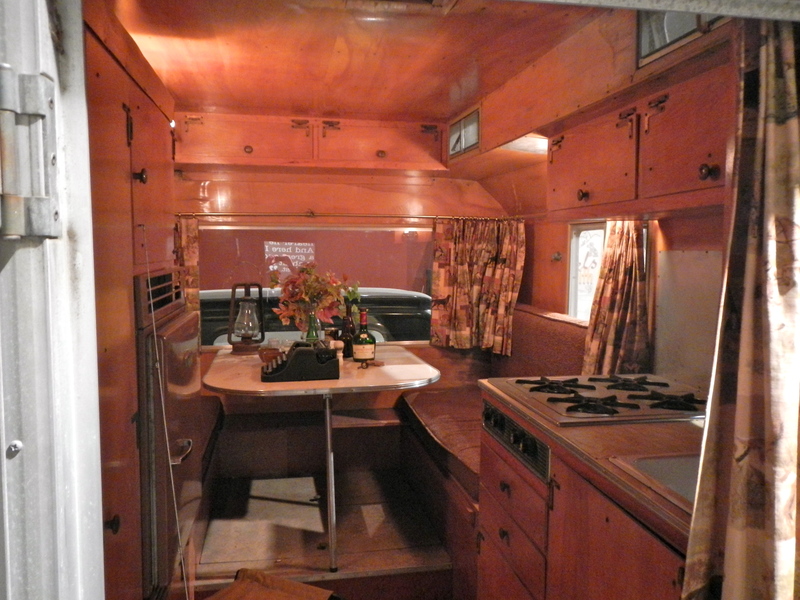 The interior of Steinbeck’s pickup camper. 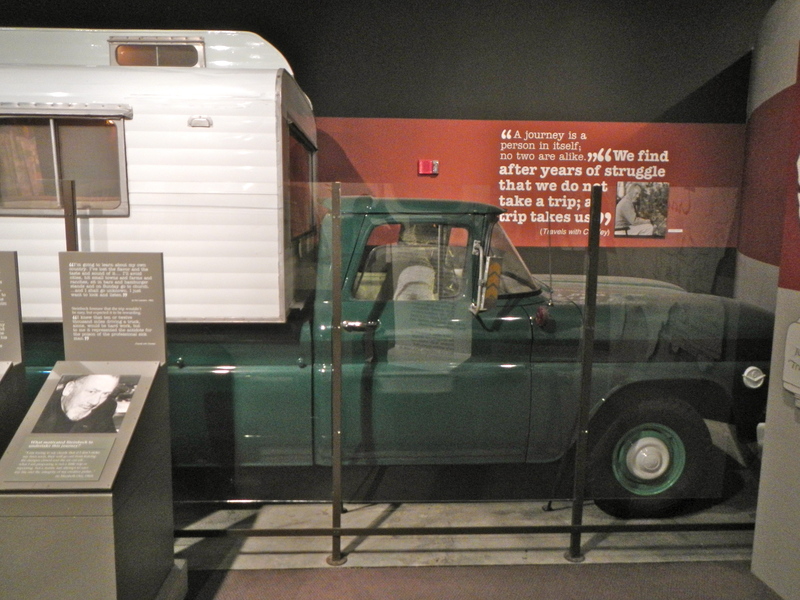 (Kaye writes) Travels with Charley is John Steinbeck’s story of traveling the country in an early version of the pickup camper “in search of America” in the fall of 1960. I had read it several years ago, but it seemed only fitting to re-read it while on our epic journey. I carried it in the cab of our pickup truck to read while driving across the country in January, but discovered very little time to read – maybe because I was too busy observing America on my own journey. Once we settled in at our new spot in southern California, I pulled out the book and once again appreciated Steinbeck’s writing. I did a bit of research on his life and decided to read some more of his stuff. In that process I discovered that he had grown up not too far from where we were living. When we began to plan our journey northward, we decided to drive through that area that had shaped so much of his writing. So we did that two days ago, up along the Salinas River, past the town of Soledad which provided the setting for Of Mice and Men, and then to the town of Salinas where we became tourists for a day. We took pictures of the house where Steinbeck was born, we walked the streets he walked and we ate lunch where he had eaten. And yes, we toured the National Steinbeck Museum which by the way is the only museum in the U.S. dedicated to a single author – and learned much more about his life and his writings and about the area that provided the background for so many of his stories. I enjoyed the exhibits which are arranged according to the geographical settings of his many titles, but the culmination of my quest was to see Rocinante, this vehicle that has inspired so many of us. It was a good day, a fun day, and an educational day. But more than the area, more than the historic sites, more than the accolades (and there were many!) even more than Rocinante, what I like best about Steinbeck and what I can carry with me are his words. 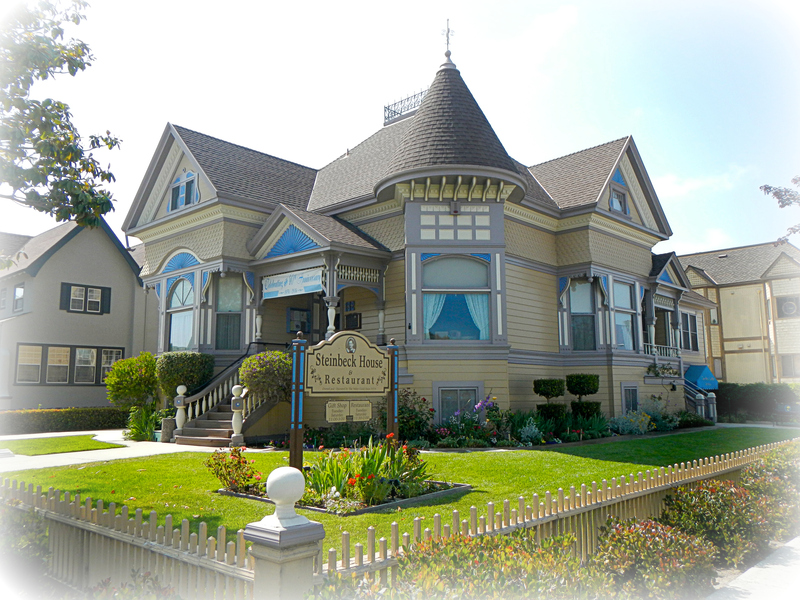 The birthplace of John Steinbeck is now a restaurant. 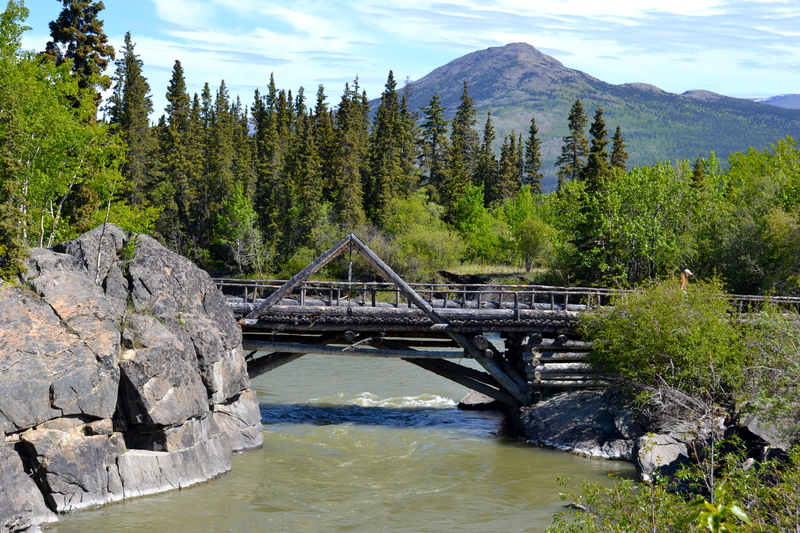 (Bob writes) Our epic trip to Alaska has to be advanced in small sections too, a day at a time, so that we aren’t overcome with that “sick sense of failure” that Steinbeck experienced. Today we head north only 130 miles, to visit some of Kaye’s relatives in Ashland, Oregon, then on to Portland the next day, “gradually writing one page and then another,” like Steinbeck.